Find Time to Be Kind – You and Your Business Will Benefit – Kathy J. Marshack, Ph.D. Showing kindness to others directly affects your own happiness. You’ve probably already noticed that when you help other people, it makes you feel good. But do you know why? By focusing on other people and working to make their life better, you think less about your own problems and worries. This keeps you from dwelling on the negative and moves you to focus on the positive. This is good news for your health! Positive thinking can boost your immune system, lower your blood pressure, and lessen your risk of heart disease. Since there is an inseparable connection between the mind and the body, feelings of joy, sadness, anger, hope, and apathy directly affect your body. So, by replacing negativity and pessimism in favor of kindness and joy, you can improve your physical health. Showing kindness is also a great way to create and enhance social connections with people, which can foster a sense of purpose and meaning in life. Think about a time that you volunteered in your community or took a moment to say or do something for a stranger. Didn’t you feel more connected with others and possibly made new friends in the process? One small act of kindness can trigger a chain reaction. A small thing to you can mean everything to another person. It can move them to do something nice for someone else. When you show kindness to others, they are more likely to show kindness in return. Your one act can spread out into the community and come back full circle to where you are on the receiving end of someone else’s kindness. But how can kindness benefit your business? You might think that entrepreneurs need to be tough and aggressive but actually kindness does help you run a successful business. For one thing, as we already discussed acts of kindness fosters optimism. What business owner doesn’t need an abundance of that quality? You’ll notice that showing kindness keeps you in touch with your community. 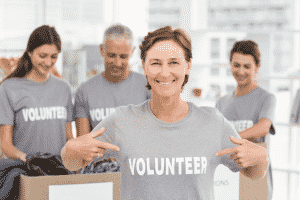 Involving yourself and your employees in community events or fundraisers promotes a team spirit. It also helps your company’s reputation as a business that cares, which helps you stand out in a competitive marketplace. The advent of social media is a great tool to offer memorable customer service. People are quick to lament a faulty product or terrible service on social media. When that happens, without being asked, reach out with a friendly note, send a free product, offer a sincere apology… Basically do something kind. These are interactions that people will remember and tell their friends about. Kindness in the workplace also contributes to employee retention. Good, loyal employees can be hard to find. Once you find them, you have to work to keep them. A happy workforce is a good workforce. So encourage laughter, teamwork, and bonding. Express appreciation and offer commendation. Small acts of kindness, like buying lunch for the office, can make a big difference. Are you convinced that being kind is worth the effort? Sometimes it can be challenging to be kind if you’re dealing with a lot of internal or external stress. If you could use some help please contact my office to set up an appointment. I have an office in Jantzen Beach where we can meet in person or I offer online therapy if that’s a better fit for you.